Normally, I try my very best to stay away from Dine Out. No, it is not because the food isn't any good. Yes, that was true 5 years ago, when all I found was mediocre dishes made from substandard ingredients. Fast forward to the present and the options are more substantial while the food quality has improved. I just find it too busy to fairly judge a restaurant during this time. 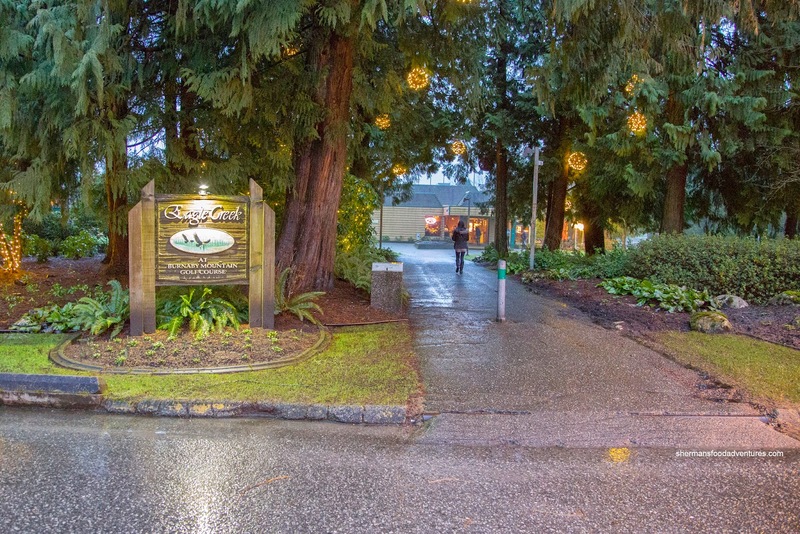 But I have to make an exception this time around because I was pleasantly surprised at a random dinner at a nearby place - the Burnaby Mountain Clubhouse. It was so unexpected, I only brought along my backup camera (no not from the car), hence, the strangely lit photos. 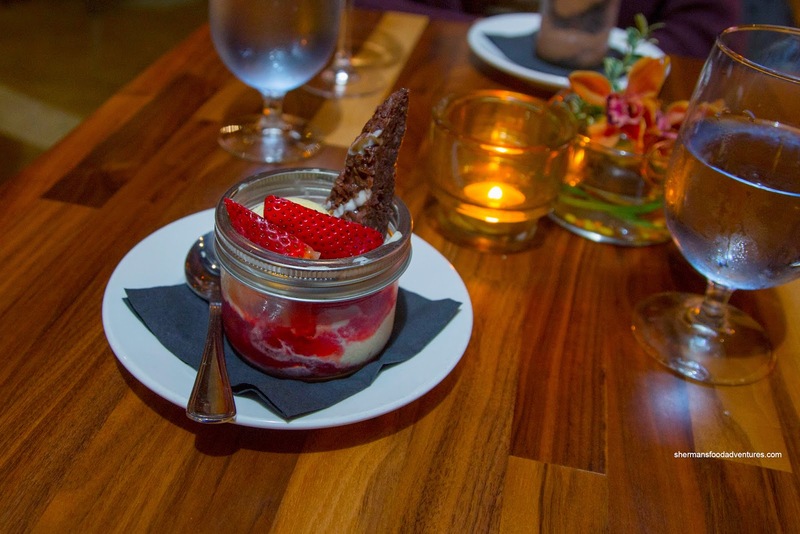 As part of their $18.00 Dine Out menu, there were 3 choices each of appetizer, entree and dessert. 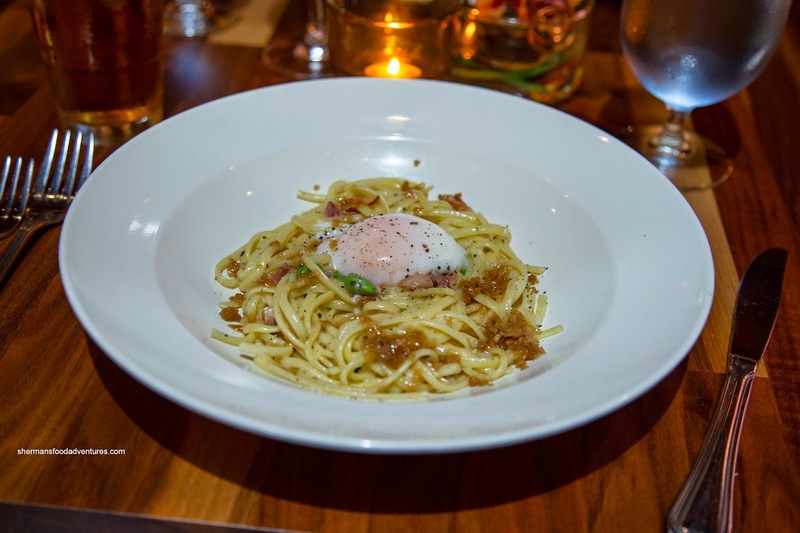 Viv decided on the Onsen Egg Carbonara (Guinness cheddar, bacon, edamame and linguine) featuring a slow-cooked egg (in its shell) that resembled the texture of soft custard. When mixed with the barely toothsome (on the softer side of al dente) noodles, it caressed each strand with a silky touch. Although there was plenty of rendered bacon in the dish, a touch more salt would've heightened the flavours. 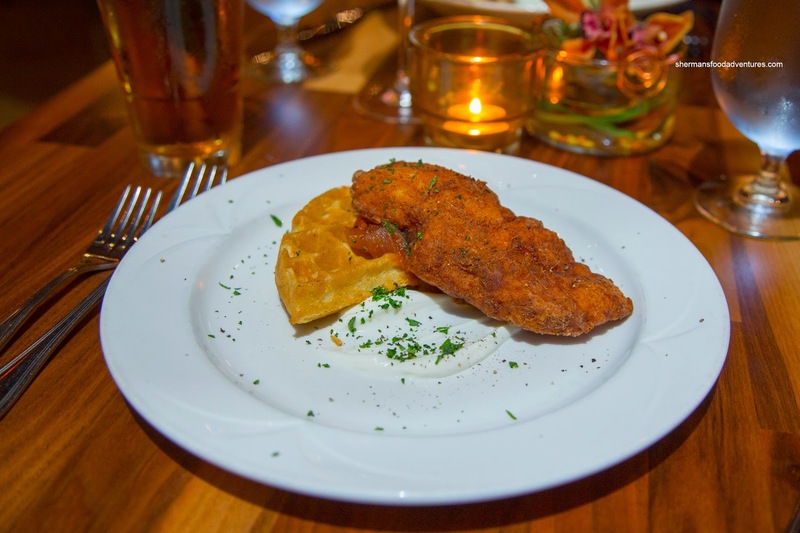 For myself, I had the Louisiana Fried Chicken and a freshly made waffle, tomato & jalapeno chutney and sour cream. The large chicken breast was moist while the breading was golden and crunchy. I thought it was seasoned enough to stand on its own. As for the waffle, it was a bit more dense than I would've liked. The chutney was a bit strange being really sweet, yet looking like a salsa. Onto the mains, I decided on the vegetarian dish, not... Actually, I had the 8 oz. 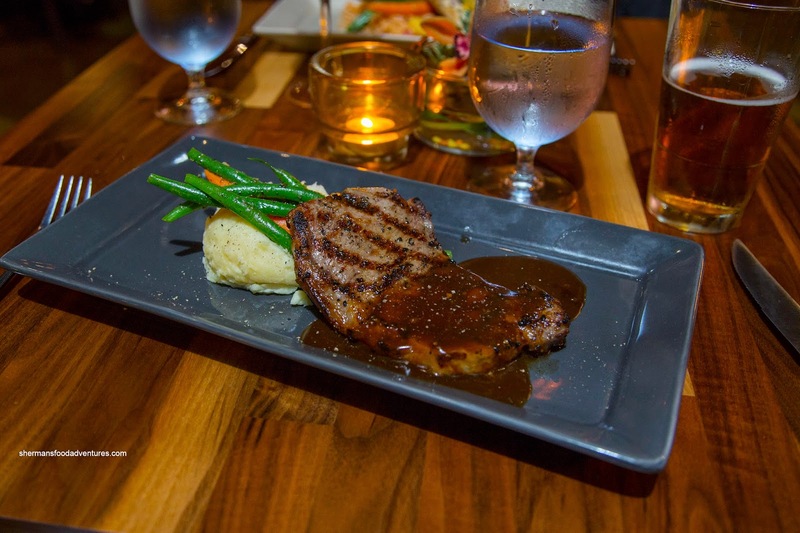 Certified Angus New York Steak with Yukon gold roasted garlic mash, market vegetables and green peppercorn sauce. It was prepared medium-rare as I requested. I liked how it was rested properly and the noticeable char on the outside. Hence, each piece of steak was succulent, smoky and tender. On the thicker side, the peppercorn sauce was flavourful without being salty. It added an almost sweet peppery finish to each bite. The garlic mash was buttery and smooth with the veggies on top being crunchy and vibrant. One thing I didn't like was the toss of dry Italian herb mix as it was a bit bitter. 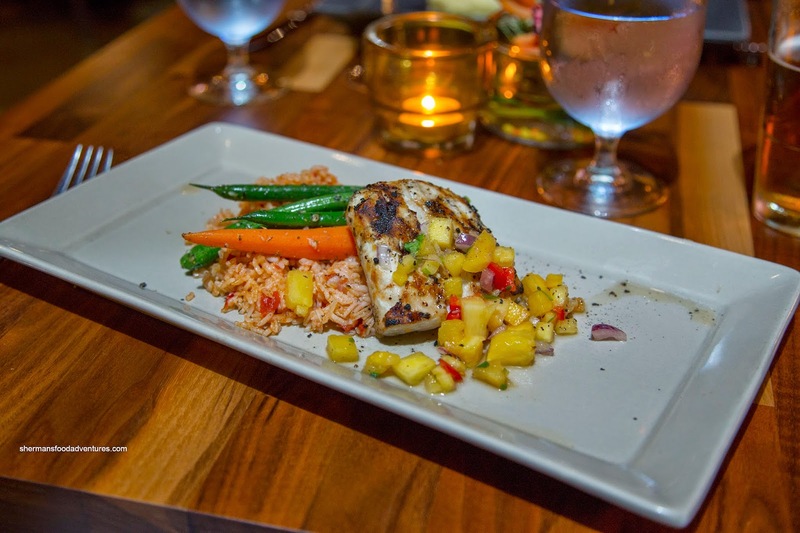 For Viv, she tried the Char Broiled Mahi Mahi with Southern rice pilaf, market vegetables and fresh pineapple salsa. The fish was definitely the beneficiary of a good broil, however, it was a touch dry in spots. It wasn't particularly seasoned much, but the salsa did add the necessary sweetness and acidity. We found the rice a touch wet while being quite firm in texture at the same time. It wasn't particularly Southern tasting though as we expected more spice. For dessert, I chose the Strawberry Sundae consisting of vanilla ice-cream, strawberry coulis and chocolate & coconut brownie. This was a simple dessert done right. The ice cream was thick and creamy while the coulis wasn't overly sweet. As much as the brownie was gooey and chocolaty, I personally don't like coconut in it (interrupts the gooey texture). 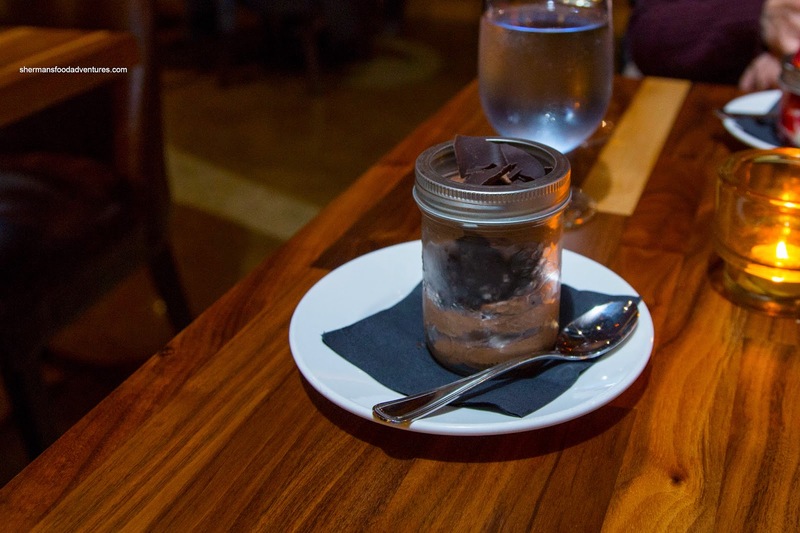 Viv went for the Dark Chocolate Mousse with Oreo cookie bits and shaved chocolate. We thought the mousse was on the heavier side, but still smooth and rich. It wasn't too sweet while exhibiting a slight bitterness. With a pleasing crunch, the Oreo bits were a welcomed surprise. In fact, the whole meat was pleasant surprise, especially at the $18.00 price point. Sure, the menu didn't really make much sense (as most of the appetizers could've been main dishes) while the refinement was debatable. BUT, considering what used to be available before the relaunch, this is a major improvement. If you aren't overly picky and just want a decent meal out in a comfortable and relaxed atmosphere, go check out the $18.00 dine out menu.